In this swatch, I casted on 50 stitches. 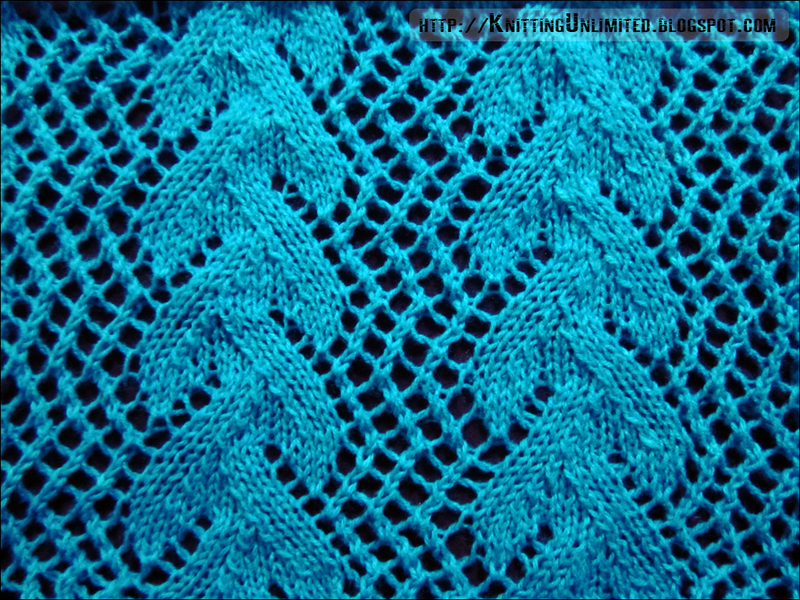 Braided Leaf stitch is a 12 row repeat and is knitted in a multiple of 19 stitches plus 12. Row 1 (RS): K2, k2tog, (yo, k2tog) 3times, * yo, k1, yo, k2, ssk, k4, skpo, k2, (yo, k2tog) 3times; repeat * to last 2 sts, yo, k2. Row 3: K1, k2tog, (yo, k2tog ) 3times, yo, * k3, yo, k2, ssk, k2, ssk, k2, ( yo, k2tog) 3times, yo; repeat to last 3sts, k3. Row 5: K2tog, (yo, k2tog) 3times, yo, k1, * k4, yo, k2, ssk, ssk, k2, ( yo, k2tog) 3times, yo, k1; repeat to last 3 sts, k3. Row 9: K3, (yo, k2tog) 3times, * yo, k2, skpo, k2, ssk, k2, yo, k3, (yo, k2tog) 3times; repeat from * to last 3 sts, yo, k2tog, k1.